't Zand 21, 8000 Bruges, Belgium. 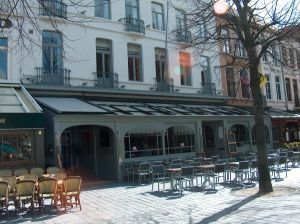 Hotel 't Zand is a small hotel with 19 rooms, which is situated in the very heart of unique Bruges. 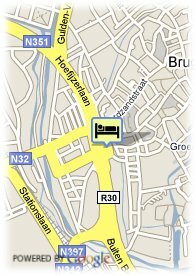 It is easily reached via the E40 (exit8) and you will find our hotel right opposite the main exit of the underground car-park "' t Zand". It is onlya five minutes walk from the trainstation of Bruges and no more than 400 metres from Bruges "Grand Market Place". Hotel 't Zand is perfect for a stay with the whole family, guaranteeing highly comfortable and pleasantly arranged rooms, all including bathroom with bath/shower and hair dryer, toilet, airconditioning, LCD flat screen tv, telephone and internet connection. We also have a cosy restaurant with delicious food at fair prices. Specialties are fresh fish, Giant Gamba's and several grill dishes. Suggestions every season, snacks and local dishes. Near trainstation, Centre, Museum Area, Near the historic centre. Babybeds: 7.50 € for each additional babybed.